An intimate look at Dhoni from the eyes of friends and those he grew up with in Ranchi. There have been several books on Mahendra Singh Dhoni. Each of the authors have claimed to know Dhoni inside out - yet, the truth is that only a select few know much more other than what is portrayed in the media. It is here that The Dhoni Touch - Unravelling the Enigma That Is Mahendra Singh Dhoni by cricket writer Bharat Sundaresan stands out. It is not quite a biography as Sundaresan has not chronicled the highs and lows of Dhoni's career, nor his days as a train ticket collector. Nor, for that matter, his romantic life as portrayed in his biopic MS Dhoni: The Untold Story. What Sundaresan does is give insight into what makes Dhoni popular. Sundaresan has covered cricket extensively for Indian Express for a decade, going the extra mile in search of stories with a human touch. The most noteworthy was that of former West Indies pacer Patrick Patterson, whose whereabouts were not known even in his native Jamaica until Sundaresan traced him after three tours to the Caribbean. This book, Sundaresan's maiden attempt, is no run-of-the-mill stuff. Directed by Dhoni himself to visit Ranchi and meet his closest friends to know more about him, Sundaresan traces aspects of the cricketer's life that few know about. Sundaresan has spent time with Dhoni's friend at the sports shop, Paramjit Singh (Chottu bhaiya), his school coach Keshav Ranjan Banerjee, groundsman at the MECON Stadium, Umakanta Jena (Jena Da), his army friend Col Vembu Shankar and ad film-maker Chockalingam, among others, revealing his love for the Parachute Regiment and also how cooperative he is at TV commercial shootings. He also quotes two former cricketers and selectors who have closely followed Dhoni's wicketkeeping and leadership qualities - Kiran More and VB Chandrasekhar. All of them recount interesting anecdotes about Dhoni's life, but none more so than Seemant Lohani (Chittu). Dhoni and Chittu have been together since their school days at the MECON colony in Ranchi; even Dhoni's wife Sakshi consulted him for the finer points of the construction and interiors of their house when the cricketer was away on game duties. There seems to be a close friendship between Dhoni and Sundaresan, not necessarily for cricketing reasons. Sundaresan himself sported long hair like Dhoni in the earlier days, and begins the book with a reference to how Dhoni would, every time the two met, start the conversation with " balkaat lo, yaar (cut your hair)". On one occasion on a tour, Sakshi even arranged to trim Sundaresan's hair and promised to bring Dhoni to do the honours. Sundaresan politely refused and continues to have long hair though Dhoni has trimmed his, even going bald within hours of lifting the 2011 World Cup, doing it all by himself in his hotel room, taking a good 45 minutes for the makeover. That Dhoni sticks by his friends is well chronicled. Sundaresan quotes Chittu saying, "He doesn't believe in leaving anyone behind. He might have become the biggest celebrity in the country right now. But he believes in taking everybody forward." 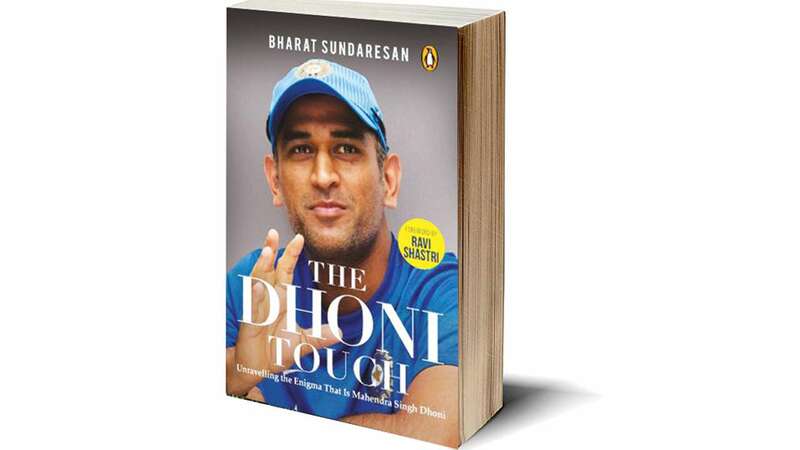 Sundaresan sums up best towards the end of the book: "His journey has been one based on self-education, and along the way, he has learnt that he's just Dhoni. A man who was not born to be a cricketer but became one. A man who was not born to be a captain but became one. A man who was not born to be a legend but became one. A man who was born to be an enigma and will always remain one." If there is one drawback about this book, it has to be the lack of pictures. There is no illustration or photo of Dhoni even inside the book, making it look like a staid book of essays. A book without photographs does not get my nod, but the quality of writing - Bharat keeps it simple and interesting, taking readers to Ranchi and making them feel as if they are amidst Dhoni's friends - this book is highly recommended.